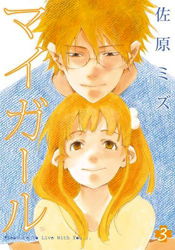 After the death of her mother, Kaoru alone has to handle school, her boyfriend, and living with her eccentric father. She angrily suspects her father of starting a new relationship with their beautiful cleaning lady after watching them together. But nothing in Kaoru's life is as simple as it first appears, and her father's secrets are far stranger than she could ever imagine. Hmm... well, at least the one-shot looks interesting. I hope someone translates/scanlates that. 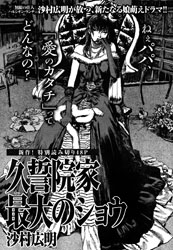 In other news, former shout out Touhou Sangetsusei got scanlated and if you're looking for something to scanlate, Himawari has a translation out. Oh, and check out Livingstone if you haven't done so already. Samura's one shot is pretty crazy but... uses some silly devices. Teiji-kun seems like a bloody one? My girl is <3. An english team currently scanlate it "Strom in heaven" if I remember right. 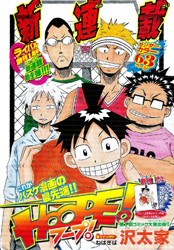 sweet, a new Hiroaki oneshot. Teiji - kun looks outstanding. Small shout this time, heh. My Girl looks very interesting; I checked out the art and it looks like real good stuff too. :D I'll definitely be keeping my eyes on that one.